HULK SHORT CUT: WHY CELEBRITIES GET MARRIED | Birth.Movies.Death. Hulk gives a mini (for Hulk) treatise on celebrity marriages. ZOMG! RUSSELL BRAND AND KATY PERRY GOT DIVORCED! ... WELL... THESE THINGS HAPPEN. IN THE RESULTING SOCIAL MEDIA / TABLOID FALLOUT A LOT OF FOLKS DID THAT THING PEOPLE DO WHERE THEY MAKE FUN OF EITHER PERSON, BOTH PEOPLE, OR CELEBRITY MARRIAGES AT LARGE. AND HONESTLY THAT'S FINE, THERE IS AN IMPLICIT ACCEPTANCE IN SOCIETY THAT GOES ALONG WITH CELEBRITY MOCKERY. BUT IN ALL THAT JOKING, THE ONE THING HULK STILL NOTICED WAS THAT THERE WAS STILL A DISTINCT LACK OF UNDERSTANDING AS TO WHY CELEBRITIES ALWAYS SEEM TO GET MARRIED IN A RUSH AND THEN DIVORCE SO QUICKLY. WHY DOES THAT HAPPEN ANYWAY? DO THEY KNOW NOTHING OF HOW LOVE AND COMMITMENT WORKS? ARE THEY ALL JUST STUPID PEOPLE WE SHOULD MAKE FUN OF? WHY DOES IT HAPPEN? FIRST OFF, LET US UNDERSTAND THAT THESE STUPID 1 MONTH-1 YEAR MARRIAGES HAPPEN A GOOD DEAL WITH US "NORMAL FOLK" TOO. THE QUICKIE MARRIAGE/DIVORCE IS NOT SOME AMORAL EXCLUSIVITY TO CELEBRITIES (NOR IS IT EVEN REALLY AMORAL). THE EXCEPTION GOES THE OTHER WAY TOO. FOR EVERY RUSSELL BAND AND KATY PERRY THERE IS SOME OTHER HOLLYWOOD COUPLE DOING JUST FINE AND TOTALLY BEING A NORMAL, SOMEWHAT-RESPONSIBLE COUPLE. SO NOW THAT WE'VE LAID THAT BIT OF QUALIFICATION ON THE TABLE, HULK CAN GET TO THE DAMN POINT. THE REASON THE QUICKIE MARRIAGE IS COMMONPLACE IN HOLLYWOOD IS BECAUSE A CELEBRITY'S LIFE IS FILLED WITH SUCH STUNNING IMPERMANENCE. YOU REALLY HAVE NO IDEA. MOST OF US HAVE VERY STATIC LIVES AND EVEN THOSE OF US WHO TRAVEL FOR WORK, REALLY AREN'T FACED WITH THE BARRAGE OF SOCIAL ENGAGEMENT REQUIRED OF BEING A CELEBRITY. THERE IS THE ABJECT ATTENTION, THE GLARE, THE PARADE OF NEW FACES AND NEW PEOPLE YOU ARE REQUIRED TO CONNECT WITH. AND THIS RAPID IMPERMANENCE IN TURN CREATES THESE LITTLE INSULAR WORLDS FOR THE CELEBRITY TO CREATE THEIR OWN MEANING OF "HOME." IT COMPRISES CLOSE FRIENDS WHO TRAVEL ALONG ON YOUR DIME. PUBLICISTS. AGENTS. HANGERS ON. BACK-UP DANCERS. GROUPIES... YEAH, YOU MIGHT HAVE NOTICED THAT THESE HOMES ARE JUST PARTS OF THE MACHINERY OF CELEBRITY AND THUS THEY HAVE OBVIOUS TEMPORARY SHELF LIVES. FOR INSTANCE, EVERY TIME AN ACTOR MAKES A MOVIE IT'S LIKE GOING TO SUMMER CAMP (REALLY, THAT IS THE EXACT FEELING OF BEING ON A MOVIE CREW). SO THINK BACK TO THE SOCIAL DYNAMICS OF SUMMER CAMP... YUP, IT'S LIKE THAT... AND UNLIKE CAMP, IT HAPPENS ALL YEAR, CHANGING EVERY FEW MONTHS. IT'S IMPERMANENCE. SO THE FIRST THING THIS IMPERTINENCE DOES IS IT MAKES MAINTAINING ANY KIND OF RELATIONSHIP VERY, VERY DIFFICULT. BOTH THE CONDITIONS OF THE RELATIONSHIP AND THE WAY THEY UNDERSTAND THEIR RELATIONSHIP CAN CHANGE IN A SECOND. AND THEN CHANGE AGAIN. AND THEN CHANGE YET AGAIN. "HURRAY WE JUST GOT A FLAT IN LONDON! OH, WE'RE NOT GOING TO BE THERE FOR THE NEXT 8 MONTHS? ... OKAY." YOU MAY THINK THIS SOUNDS LIKE THE COMPLAINTS OF THE SUPER-RICH (AND THEY ARE) BUT THINK ABOUT THE STRESS OF THE BASIC EMOTIONAL STUFF AT PLAY. EQUATE IT TO YOUR OWN LIFE. AND IT'S NOT EVEN LIKE ONE PERSON IS TRAVELING AND THE OTHER IS THE "HOMEBASE" SO TO SPEAK. BOTH CELEBRITIES ARE CONSTANTLY CHANGING THE ENTIRE MODUS OPERANDI OF THEIR LIVES. THINK COLLEGE LONG-DISTANCE IS HARD? TRY THIS. CELEBRITIES RELATIONSHIPS ARE EXCEEDINGLY DIFFICULT TO MAINTAIN FOR REASONS THAT HAVE NOTHING TO DO WITH THEIR CHARACTER OR DISPOSITION. IT IS THE SCENARIO THAT IS THE PROBLEM. SO NOW COMES THE CATCH 22. WHAT IS PERHAPS UNFORTUNATE IS THAT SO MANY CELEBRITIES ARE ATTRACTED TO EACH OTHER BECAUSE THEY IMPLICITLY UNDERSTAND BOTH THE REQUIREMENTS OF BEING A CELEBRITY AND ALSO THE STUNNING RATE OF CHANGE THAT GOES ALONG WITH IT. CELEBRITIES ACCEPT IT IN ONE ANOTHER AND THAT IS RATHER COMFORTING. WHY? BECAUSE WHEN CELEBRITIES DATE SOMEONE OUTSIDE THAT WORLD THEY FIND THAT THE OTHER PERSON OFTEN DOESN'T REALLY UNDERSTAND. THE OUTSIDE PARTNER IS ENAMORED OF THE CELEBRITY ITSELF. THEY DISASSOCIATE FROM YOUR ACTUAL PERSONALITY. THEY MAY JUST WANT FAME FOR THEIR OWN RIGHT. MORE THAN THAT, THEY CANNOT GET USE TO THE "BARRAGE OF IMPERMANENCE" THAT GOES ALONG WITH IT AND OFTEN RESORT TO JEALOUSY. THUS, CELEBRITIES TURN TO OTHER CELEBRITIES. WHICH BRINGS US TO THE PROBLEM. THE ATTRACTION TO SOMEONE WHO UNDERSTANDS THE SITUATION UNFORTUNATELY MEANS THEY ARE ALSO GETTING INVOLVED WITH SOMEONE WITH THE SAME COMPLICATIONS OF IMPERMANENCE. THEY ARE LITERALLY DOUBLING THE DIFFICULTY AND REMOVING THE VERY POSSIBILITY OF HAVING THE "BASE" THEY ACTUALLY WANT AND NEED. THE VERY THING THEY SEE AS A SOLUTION IS THE SAME THING THAT SETS THEM UP FOR EVENTUAL FAILURE. AND OF COURSE, HULK WOULD BE REMISS TO NOT MENTION HOW CELEBRITIES ARE TEMPTED WITH INDISCRETIONS ALL THE FREAKING TIME. HULK THINK IT HARD TO UNDERSTAND HOW OFTEN AND TO WHAT DEGREE A CELEBRITY IS FACED WITH CONSTANT LEVELS OF TEMPTATION. THE DEGREE OF WHICH IS UNFORESEEN BY THE LIKES OF YOU, HULK, OR ANYONE ELSE ON THE PLANET (EXCEPT STARK, WHO TOTALLY COUNTS AS A CELEBRITY), BUT THE ATTENTION IS QUITE CONSTANT. MORE IMPORTANTLY, THE ABILITY TO ACT ON IT IS FAR TOO EASY. THUS, CELEBRITY IS PROBLEMATIC FOR ANYTHING THAT EVEN APPROACHES THE IDEA OF MONOGAMY. THIS SITUATION IS EXACERBATED BY THE FACT THAT WHEN SOMEONE IN REAL-LIFE CHEATS, THERE IS NOT PHOTO CREW READY TO CATCH THEM. IN REAL LIFE, ONLY THE PRINCIPALS INVOLVED ACTUALLY CARE. WITH CELEBRITIES, EVERYONE ON THE PLANET SEEMS TO CARE. BUT WHAT'S SORT OF FUNNY IS THAT DESPITE ALL THIS HUBBUB, THERE TENDS TO BE FEW TRULY NEGATIVE RAMIFICATIONS OF CELEBRITY MARRIAGE BLOW UPS, OUTSIDE OF SNARKY PRESS ATTENTION. THEY ALL TEND TO SIGN PRENUPS. THE COST OF THEIR LAVISH WEDDINGS ARE OFTEN NOT SO MUCH MONEY TO THEM. IF THERE ARE NO KIDS, THEN THE THE TANGIBLE COSTS OF THESE DIVORCES ARE RATHER SMALL. AND THE COST OF "WORKING THROUGH IT" IS MUCH HIGHER THAN IT IS FOR OTHER "NORMAL FOLK." SO ALL THESE DETRIMENTS AND PROBLEMS LEAD TO A MUCH BIGGER QUESTION: IF CELEBRITIES' LIVES ARE SO FILLED WITH IMPERMANENCE AND DIFFICULTY, THEN WHY DO THEY EVEN BOTHER GETTING MARRIED IN THE FIRST PLACE? THE SAME REASON WE ALL DO. BECAUSE WE LIKE TO BELIEVE WE ARE GOOD PEOPLE. SOME MAY FIND THAT STATEMENT ON MARRIAGE TO BE A LITTLE CYNICAL , BUT THAT'S NOT REALLY NOT HOW IT IS MEANT. THE VAST MAJORITY OF PEOPLE GET MARRIED DO SO BECAUSE THEY REALLY LOVE THAT OTHER PERSON. EVEN IF THEY ARE AFRAID, THEY REALLY BELIEVE IN THAT MOMENT THAT THIS MARRIAGE COULD BE THE ONE AND ONLY TIME. THIS TRUE OF CELEBRITIES TOO. WE ALL WANT PERMANENCE, OR AT LEAST THE GOOD FEELINGS THAT COME ALONG WITH IT. BUT THAT'S NOT ALL OF IT. HULK WOULD ARGUE THE DESIRE TO BE "A MARRIED PERSON" CONTAINS SOME SMALL FACET OF TRYING TO BE A BETTER PERSON. IT MEANS IMPLICITLY MEANS WE CAN COMMIT. THAT WE HAVE HONOR. THAT WE DEVOTE OURSELVES TO OTHER PEOPLE. THAT WE CAN BE BIGGER THAN OUR OWN INDULGENT AND MOST BASE DESIRES. YES, YOU DON'T HAVE TO GET MARRIED TO SAY THOSE THINGS, BUT IF YOU DO GET MARRIED YOU INHERENTLY SAY THOSE THINGS. THAT'S WHY MARRIAGE IS A TOTALLY NATURAL CHOICE FROM THE MONOGAMY-INCLINED. BUT FOR OTHER PEOPLE? WHAT MARRIAGE SAYS ABOUT YOU IS SOMETHING THAT IS WHOLLY ALLURING. WHICH TURNS MARRIAGE INTO AN ACTIVE CHOICE TO SAY "I'M NOT GOING TO BE LIKE I AM WHEN I WAS SINGLE! I'M GOING TO CHANGE!" SOMETIMES IT WORKS, AND A LOT OF TIMES IT DOESN'T. BUT HULK BELIEVES THIS "BETTER PERSON" THEORY IS AN IMPORTANT COMPONENT TO WHY CELEBRITIES GET MARRIED. SINCE CELEBRITIES ARE ASSAULTED EVERY DAY BY STUFF THAT'S BASICALLY "THE OPPOSITE OF MARRIAGE," THEN EVERY DAY THE IMPERMANENCE AND OPPORTUNITY FOR PARTNERS STACK UP AGAINST THEM. IT CREATES A DEEP AND PROFOUND LONGING, THAT CAN ONLY BE BORN FROM THE MOST DECADENT FORMS OF ENNUI. YOU KNOW THAT FEELING YOU GET WHEN YOU'VE BEEN AWAY FROM HOME FOR TOO LONG? WHEN YOU MISS YOUR BED AND YOUR FOOD? THAT'S HOW CELEBRITIES FEEL ALL THE TIME. ONLY IT'S NOT JUST ABOUT TANGIBLE THINGS, BUT A LONGING IN THEIR VERY SOULS... UGH... HULK JUST SORT OF BARFS AT EVEN WRITING THAT LAST SENTENCE WITH THE HOST OF THE WORLDS PROBLEMS OUT THERE, BUT THERE IS A REAL TRUTH TO IT. MANY CAN'T EVEN HAVE A BASIC CONNECTION TO CLOSE FRIENDS AND FAMILY THE WAY WE DO. THE MONEY AND FAME CORRUPTS SO MUCH OF THAT. BUT BECAUSE SO MANY CELEBRITIES CAN'T JUST STOP THEIR CAREERS, THEY INSTEAD REACH OUT FOR SOLUTIONS. THEY BECOME PET OWNERS. THEY GET MARRIED TO SOMEONE LOOKING FOR THE SAME SENSE OF PERMANENCE THAT THEY ARE. BUT OFTEN THEY DO IT WITHOUT PUTTING THE NEEDED WORK IN. THEY DON'T HAVE THE TIME OR SCENARIO TO DO SO, BUT THEY DESPERATELY WANT TO BELIEVE THEY CAN HAVE IT. IT DOESN'T MATTER WHO. EVEN THE CELEBRITY WHO REVELS IN THE DEBAUCHERY THAT GOES ALONG WITH FAME, IS STILL SOMEONE WHO, IN THEIR HEART OF HEARTS, NEVER WANTS TO FEEL ALONE. AND TO ACHIEVE THAT, THEY HAVE TO BELIEVE THAT THEY DESERVE IT. THAT THEY ARE GOOD. AND THAT'S WHY HULK THINK CELEBRITIES GET MARRIED. AND PLEASE KNOW THIS ISN'T SOME H8R-ESQUE DEFENSE TRYING TO EXPLAIN THAT EVERYONE IS A PERSON AND THEREFORE SHOULD NOT BE SUBJECTED TO CRITICISM! NO... THAT WOULD BE STUPID. MAKE FUN OF THEM ALL YOU WANT. JUST PLEASE UNDERSTAND THESE THOUGHTS ARE FOR NO OTHER PURPOSE THAN TO EXPLORE A CONCEPT THAT IS OFTEN GLOSSED OVER. 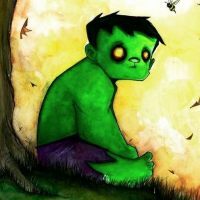 EVEN THOUGH HULK HAS POOPED OUT 1500+ WORDS ON A DUMB CELEBRITY DIVORCE, LET US NOT MISTAKE THE LENGTH FOR BEING SOME GRAND EVALUATION OR MATTER OF DEEP INSIGHT. IT JUST SOME PASSING THOUGHTS. AND DEFINITELY DON'T MISTAKE THIS PIECE AS HULK JUMPING AT SOME OPPORTUNITY TO ESPOUSE SOME PERSONAL FEELINGS ABOUT THE TRANSIENCE OR ILLUSION OF MARRIAGE, AS HULK IS PROBABLY ONE OF THE MORE MONOGAMY-INCLINED HULKS ON THE PLANET. THIS IS JUST ABOUT A MATTER OF CURIOSITY. SO WE CAN MAKE FUN OF RUSSELL AND KATY AND THAT'S ALL WELL AND GOOD... BUT IF WE REALLY ASK THAT PESKY QUESTION "WHY?" IT STARTS TO GET INTERESTING. MAYBE THEY WERE REALLY, REALLY TRYING. MAYBE THEY GOT MARRIED BECAUSE THEY SO DESPERATELY DIDN'T WANT TO BE THE VACUOUS CELEBRITY MISANTHROPES, A.K.A. THE VERY THING WE MAKE FUN OF THEM FOR. MAYBE THEY WERE JUST TRYING TO HAVE SOME PERMANENCE. MAYBE THEY WERE REALLY TRYING TO BE GOOD PEOPLE. AND MAYBE THAT'S THE SADDEST PART OF ALL.